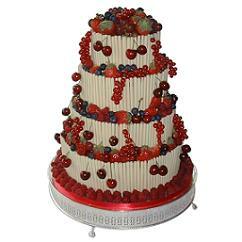 For beautiful wedding cakes that can be ordered online, visit our website for more details. We specialise in unusual cakes, chocolate cakes, croquembouche, cupcakes and cheesecake; as well as a traditional wedding cakes. Pick your favourite flavours and colours, and order online! Butterfly Design Wedding Cakes make delightful, elegant, whimsical cakes to suit you, so visit our website to see the gallery, call us, or email to discuss your ideas.